The image of the word L-O-V-E in colorful capital letters, with the first two letters stacked on top of the other two, and the letter “O” tilted, has acquired a life of its own, appearing on everything from posters and album covers to T-shirts and jewelry. Robert Indiana, the pop artist whose bold rendering of the word “love” became one of the most recognizable artworks of the 20th century, gracing hundreds of prints, paintings and sculptures, some 330 million postage stamps that he authorized and countless tchotchkes that he did not, died Saturday at his home in Vinalhaven, Maine. He was 89. Indiana’s famous image features the word L-O-V-E rendered in colorful capital letters, with the first two letters stacked on top of the other two, and the letter “O” tilted as if it were being swept off its feet. Since he designed the earliest versions, in the 1960s, the logo has acquired a life of its own, appearing on everything from posters and album covers to T-shirts and jewelry. Indiana called it the 20th century’s “most plagiarized work of art,” and he kept a collection of knockoffs in his home, a historic Victorian building, to prove it. To be sure, he had a hand in spreading the word, creating many artworks in different mediums based on the motif. And he designed the red, blue and green version that was originally issued as an 8-cent stamp by the U.S. Postal Service for Valentine’s Day 1973. It has since become one of the most popular holiday stamps in the United States. But Indiana often pointed out that he received a flat fee of only $1,000 for his stamp design. And he frequently complained that the runaway success of “Love” ruined his reputation in the New York art world. “He was an artist of consequence who gets mistaken for a one-hit wonder,” Maxwell Anderson, director of the Dallas Museum of Art, said in an interview for this obituary in 2008. Questions of authenticity continued to swirl around Indiana at the very end. The day before he died, a company that said it was Indiana’s longtime agent and had the rights to some of his important works sued a New York art publisher and a man who had become his caretaker, accusing them of forging Indiana pieces and selling them. The publisher said all the works were authorized, and the caretaker did not respond to a request for comment. Indiana, who retreated to Vinalhaven, a remote island, decades ago to escape the New York art scene, had grown reclusive in his final years. Some longtime friends and business associates said their efforts to contact him had been unavailing, or had been put off by his caretaker, who said Indiana was not able to see them. 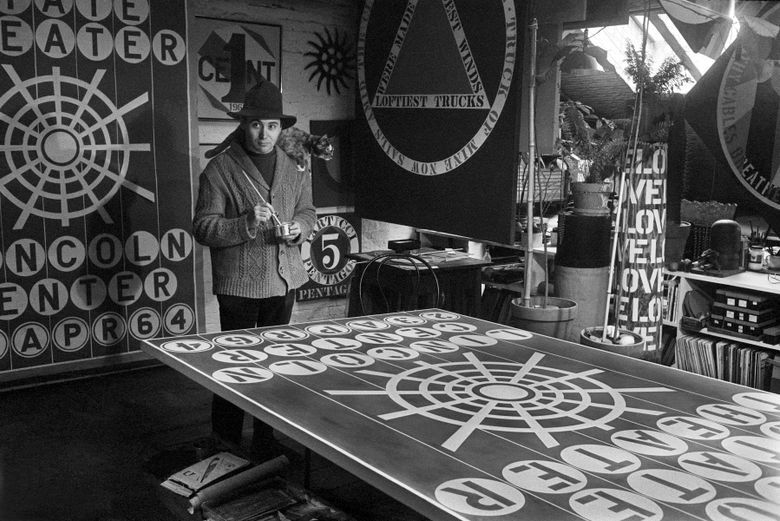 Born in New Castle, Indiana, on Sept. 13, 1928, Robert Indiana was the only child of Earl Clark and Carmen Watters and grew up as Robert Clark. He often described his early life as hardscrabble, noting that he had moved 21 times within the state of Indiana by the age of 17. His mother “couldn’t bear to live in one house longer than a year,” he said in an interview for the Smithsonian Archives of American Art. Prized for his drawing skills as early as the first grade, Indiana was not especially interested in the oil industry, but he later said that he had been mesmerized by the bold neon signs at gas stations. He graduated from Arsenal Technical High School in Indianapolis as valedictorian of his class and attended the School of the Art Institute of Chicago on the GI Bill after three years in the Air Force (known as the Army Air Forces when he began his service). Indiana himself called it “a comment on the superficiality of American life.” The critic Lawrence Alloway called it “Pop poetry of the highway.” Haskell, at the Whitney, described his use of language as one of his most important contributions, anticipating the many artists who manipulate words today. Several of Indiana’s paintings revolve around monosyllabic action words like “eat,” “hug” or “die,” a rather direct, bare-bones alternative to the sophisticated exhortations of Madison Avenue. In 1964, at the New York World’s Fair, he installed a flashing 20-foot electric sign that read “Eat”; it was unplugged almost immediately because it drew too many tourists looking for a bite. Indiana never fully discussed, at least not in public, why he made the transition to the G-rated version, which he used as his Christmas card that year. The next year, he turned it into a Christmas card for the Museum of Modern Art in New York. By 1966 he had done enough variations on the theme to have a show of “Love” prints, paintings and sculptures at Stable Gallery in New York. Indiana believed the piracy of the image harmed his reputation in the New York art world, and he retreated to Maine in 1978. But many critics countered that he had appropriated his own work shamelessly for decades. 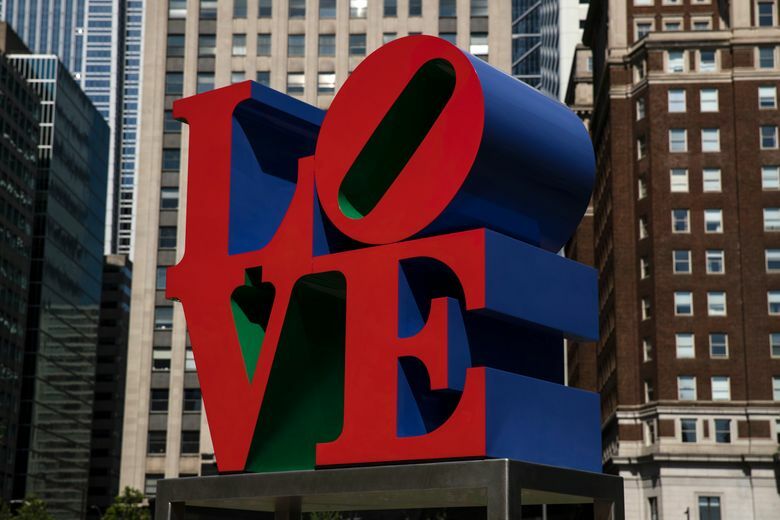 He created dozens of versions of “Love” in different mediums, planted “Love” sculptures in cities from Indianapolis to Tokyo, and cast it into different languages, including Hebrew (“Ahava”) and Spanish (“Amor”).